Here is all the steps for share a printer in windows 7, fallow the next steps and if you have any other problem, please leave a messenger. One of the advantages of Windows 7 is the operating system interface, you can say that much of configuration operations on this system are easy, from installing a printer driver to update the driver installed in the system. When we talk share a printer on a network of workplace or home network, we can to make this printer to any computer connected to the same network can make prints on the shared printer. The load can change specific printer and even view documents that are processed in this printer preferences can be changed in the settings of the printer compartment. We present a method for sharing a printer in Windows 7 as detailed as you can, besides you can ask any questions in a comment. 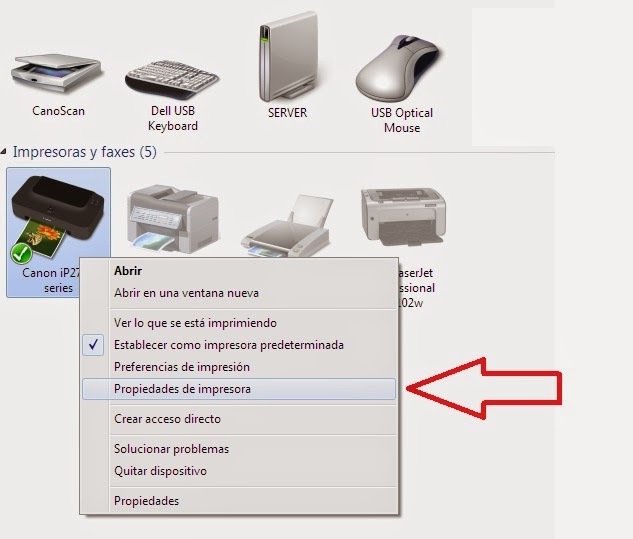 The first step is to go to the properties of the printer you want to share, steps to reach properties are: Start - Devices Printing - Printer Sharing, if we have more than one printer have to select the printer you actually want to share they may appear more than one, the fact is that we have to right click and then properties in the options. When we're in the window for our printer properties, we headed to share. The process is simple, just have to press the button to share printer, and is assigned a name to the printer, "the name that appears on the network" it is recommended that this name to avoid errors when adding the printer from another computer. Then click on apply and then accept the settings for the printer is shared has been saved. The next step is to go to another computer that is in the same workgroup and find the printer, you can see the process of adding a printer connected to the network. If you need further assistance for this configuration just type a comment in this publication.